How does the brain work? Does space go on forever? How can you outrun a cheetah? How big is the ocean? 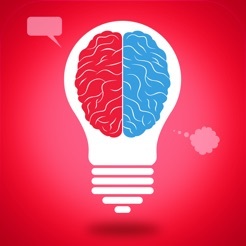 world of knowledge-rich videos built to inspire. With over 2,000 videos and counting, your children will always have something new and wonderful to watch. 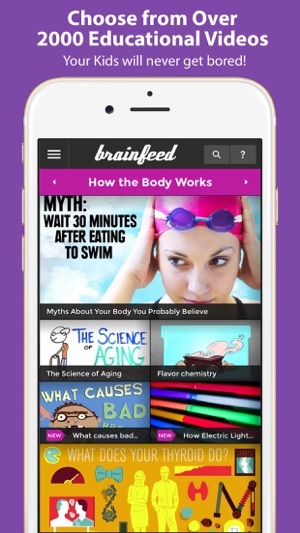 And every week new videos are added to our SEARCHABLE LIBRARY to keep Brainfeed fresh, engaging and interesting. 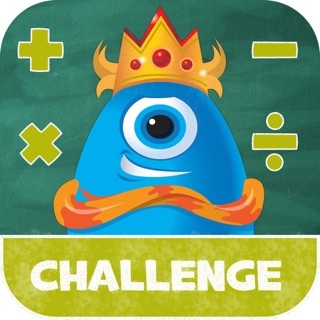 Your children will get lost in a world of learning as they get answers to questions that spark their imagination. 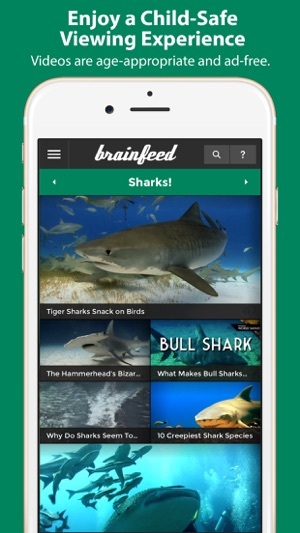 Brainfeed provides a safe, child friendly viewing experience for children 7 years and older. Videos are selected to be age-appropriate and are screened for inappropriate content. For added safety, links in descriptions are disabled, and the app can be easily password locked using the iOS accessibility options. And best of all, there are no advertisements to distract your children from quality viewing. When you upgrade to the subscription version you’ll get unlimited access to over 1,400 videos specifically designed to educate and inspire your children. With new videos added each week, your children will never be bored again. Details of our subscription offers: Monthly subscription: $1.99. Yearly subscription: $14.99. Lifetime Pass: $16.99. Payment will be charged to your iTunes account at confirmation of purchase. Subscriptions automatically renew unless auto-renew is turned off at least 24 hours before the end of the current period. Account will be charged for renewal within 24 hours of the end of the current period, and the cost of renewal will be provided. Auto-renewal may be turned off by going to the user's iTunes Account Settings after purchase. 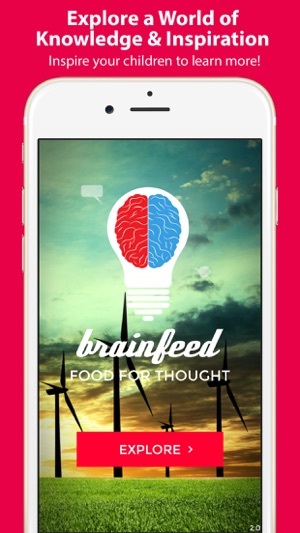 We're happy to finally bring Brainfeed to iPhone! The same great content you know and love, now available in the palm of your hand. 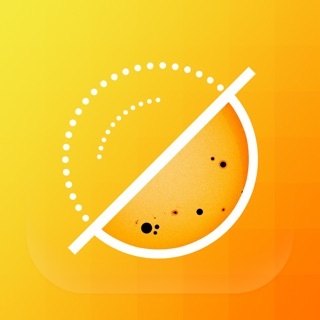 We've also cleaned up the app so it runs faster and better than ever. They have lots of videos with left wing liberal OPINIONS and not facts. I'm a political moderate but I don't want my kids brainwashed by some stupid app and that's exactly what this app is trying to do. For example, the video called "the problem with the electoral college" points out left wing opinions but completely fails to explain the history behind it or why it was included on our constitution in the first place which would allow the viewer to come up with their own opinion. This just tells them it's bad. There are several other examples of brainwashing videos in this app. Deleted. AWESOME GAME, SO EDUCATIONAL TOO! Honestly, at first when I opened this game, I was like "eww, I don't want to watch this stuff." But then, one day I opened this app and saw a video with facts I never knew! And it feels like some facts are only on that app! When you read this, just automatically rate this game 5 stars for me. Get it! It seems like it has millions of videos!